Dr. Moore spends her days professionally as an endowed professor of education at Southwestern University (SWU) in Georgetown and has been in such role for the last 17 years. Her areas of expertise include early childhood and special education, multiculturalism, social justice, and theories related to racial bias and its impact on students of color. “My big push here is to advocate for students of color,” Dr. Moore said. There at SWU, Dr. Moore advises three service student organizations, Alpha Kappa Alpha Sorority, Inc., EMPIRE, and WE RISE. For the 2017-18 school year, Dr. Moore earned the coveted title, “Student Organization Advisor of the Year.” Dr. Moore knows more than “a thing or two” about student organizations, as she too was a member of student organizations while at Huston-Tillotson University. Dr. Moore was a member of Alpha Kappa Alpha Sorority, Inc. (vice president) and RAM cheerleading squad (captain). Years after graduating from Huston-Tillotson in 1988, she penned a “Recipe for Success” for a 2007 publication co-edited by fellow alums Wilhelmina E. Perry and August N. Swain. 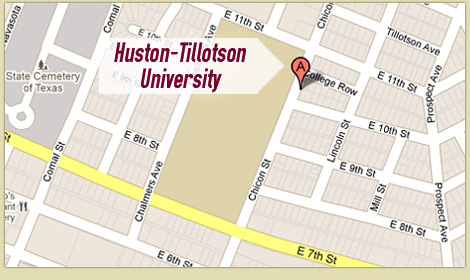 The publication was titled: The Huston-Tillotson University Legacy: A Historical Treasure and fondly known as the “Legacy Book.” The Huston-Tillotson International Alumni Association sold the book in the early 2000’s. Over 10 years later, Dr. Moore says that her Recipe is still good for success today. “The ‘Recipe for Success’ ingredients certainly work well in today’s world,” Dr. Moore said. Specifically, because the ingredients are person-centered and depend upon the individual student to (1) set their goals, (2) remain open-minded, (3) use their God-given talents, and to (4) be steadfast in their commitment to excellence rather than choosing to be mired in some of the mediocrity and entitlement that plague our society today. Just like any good recipe that evolves with new trends, Dr. Moore recently decided to add two new ingredients that will give success even more flavor. Dr. Moore added a willingness to serve and the opportunity to look beyond one’s needs to the needs of the community. For student life, Dr. Moore encourages students to be active on campus. “Find ways to work in areas that fuel a passion for your major and future career. You also should find a mentor on campus who will keep you grounded and will serve in a capacity to honor your strengths and push you to be committed to excellence;” Dr. Moore did. She credits her campus mentor, Dr. Gloria Black, and professors for her career success. “I have thrived in my career based upon my interactions and relationships with my role models in academia at HT. My professors were the wind beneath my wings. Two, in particular, were Dr. Judy Lored and Dr. Jenefred Davies. They believed in me when I did not believe in myself. They were (and still are) there for me. They attended my wedding, and I still have lunch with them periodically,” Dr. Moore fondly shared. It was these experiences and more at HT that helped guide Dr. Moore’s penning of her Recipe. At HT, Dr. Moore was serious about her academic success. She was on the dean’s list every semester. But, more than that, Dr. Moore was engaged actively in gleaning everything she could from her professors. “They were knowledgeable, great role models and provided students with a great liberal arts education,” Dr. Moore said. Actually, Dr. Moore started out at then-Southwest Texas (now, Texas State). She later transferred to HT where her first cousin, Alvin Moore, coached baseball. Dr. Moore said the same could happen to current and future HT students if they use the Recipe for Success on their HT journey. Here is even more candid advice from Dr. Moore. Unbeknownst to Dr. Moore as an HT student, her then-success foreshadowed the writing of her Recipe for Success years later as a successful educator. Secret Ingredient: Have fun while getting jobs done! Take Hopes and Dreams, mix thoroughly with Faith. Blend it with Determination, Commitment and Patience. Sprinkle abundantly with Goals. Bake it with Established Friendships. Serve daily with generous helpings of Open-mindedness and Time Management. To serve, put a BIG dollop of Going to Class on top and sprinkle with a handful of Study Skills. Garnish with God-given Talent served on top of a silver platter!